Excel 2013 is integrated to function with on-line services (new!) to facilitate it to save and open workbook on other devices and to divide them with others. 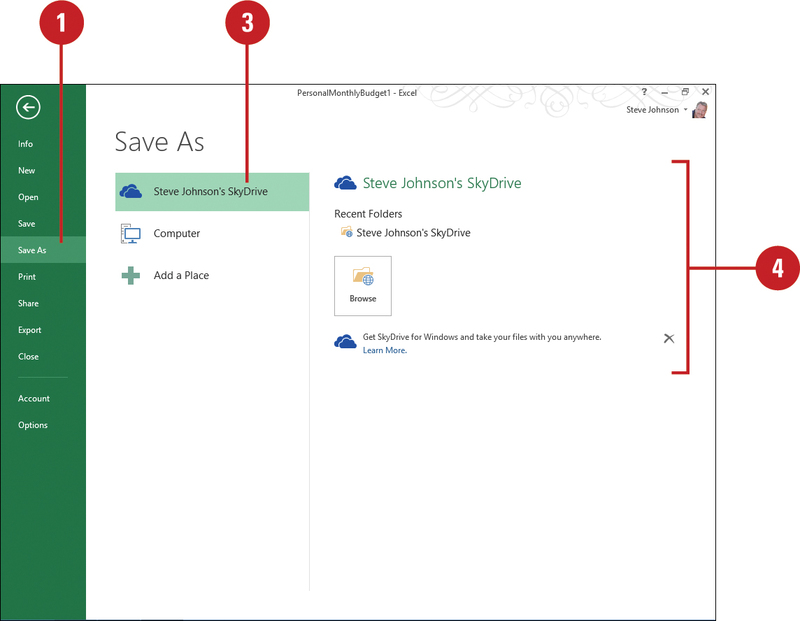 With a Microsoft or SharePoint account, you can save workbooks directly to a SkyDrive (New! ), a personal cloud-based online storage system, or Office 365 SharePoint (New! ), a customized Microsoft web site with SharePoint services. With your workbooks on a SkyDrive or SharePoint site, you can do a lot of things. You can sync the files from the SkyDrive or SharePoint site to other desktops or devices, such as a tablet or mobile phone for easy access from anywhere. You can view or edit workbooks online from the desktop Excel program or browser-based Excel Web App. You can share a workbook with other people using e-mail or social networks (New!) and even work on the same workbook at the same time with more than one person (New!). 1. Click the File tab, and then click Save As. 2. To add a shortcut place for easy access later, click Add a Place, click Office 365 SharePoint or SkyDrive, and then follow the on-screen connection instructions. 3. Click the SkyDrive or SharePoint name. 4. Click Browse or a recent folder. 5. Navigate to the location where you want to save the file. 6. Type a workbook file name. 7. Click the Save as type list arrow, and then click Excel Workbook. 8. To change browser view options, click Browser View Options, select options to view workbooks, and then click OK.